The party cake is different from others as there are no egg yolks in the mix and the ingredients are not added in like most other layer cakes. I will spare you from the methodology as you can read it in the recipe, but what you end up with is a lovely, moist snow white cake. I would have liked my cakes to rise a bit more so I could do the proper 4 layers but I measured them and they were between 1-2 cm thick. I didn't want to destroy them so I left it as a two layer cake. 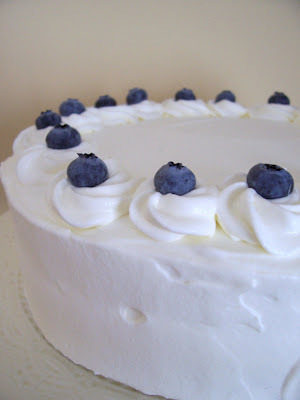 There was quite a lot of room for experimentation with this challenge and I decided to frost my cake with sweetened whipped cream and fill the cake with more whipped cream and blueberry jam. 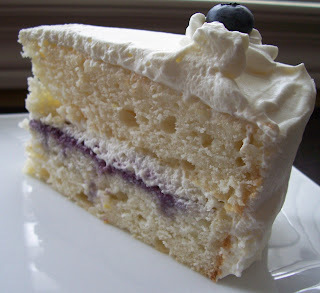 Since the cake is lemony, the blueberry flavour worked really well. Overall I liked this cake very much and so did those who ate it. 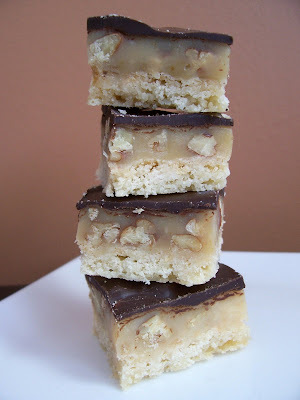 To see all the interesting variations please visit the Daring Baker Blogroll. To see the recipe go to Morven's blog and check out her cake creation. Thanks Morven for a great choice! One book that I've been reading about for quite some time on baking blogs is Dorie Greenspan's Baking From my Home to Yours. I've heard nothing but rave reviews so I finally bought it from Indigo.ca which, by the way, was much cheaper than buying it directly from Chapters. This book is serious and heavy. Dorie writes with a friendly familiarity and the book is really gorgeous. The recipes are accessible and you can imagine yourself making them all. It's the perfect 'go to' book when you need something fabulous for any occasion. 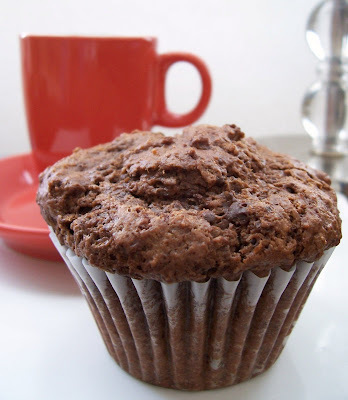 Case in point are these Chocolate-Chocolate Chunk Muffins. I have a friend who recently moved into the area so I made these for her. I didn't have to look long to find the perfect "Welcome to the Neighbourhood" treat since Breakfast Sweets is the first chapter. They're not too sweet and really chocolately. They're especially good warm when the chocolate chunks are still soft and melty. So if you're in the market for a new baking book, check it out. You won't be disappointed. I don't know why these squares are named Dixie Bars. I did some cursory investigation on the Internet but didn't really find much about their history. All I could glean was that this is a Southern American treat and that's about it. I have never been to the Deep South so I can't vouch for their authenticity but these bars sure are good. First, you start with shortbread-like crust. Do not brown it a lot otherwise it will become as hard as rock. Mine was gently browned but could easily have been taken out five minutes earlier. This is all the baking that's required - the rest is just chilling. The filling is the real show stopper of this bar. After cooking down condensed milk you get a toffee coloured mixture that is then mixed with pecans and poured on top. I always think the mixture looks caramel coloured in the pot but when I spread it on the base, I realize it's not that dark after all. You have to remember to watch it while stirring - it will burn if you forget it. After chilling, you top with melted chocolate and wait for it to set before digging in. These bars remind me of Twix Bars, just with nuts. I really enjoy the chewy centre and the three components go together very well. They're rich and indulgent and perfect for those with a real sweet tooth. Cranberries again, you ask? Well since I still had about one-third of a package of frozen berries, the answer would be yes. It's also March Break here and muffins always come in handy during the day when small people come to you saying, or yelling, "I'm hungry!". 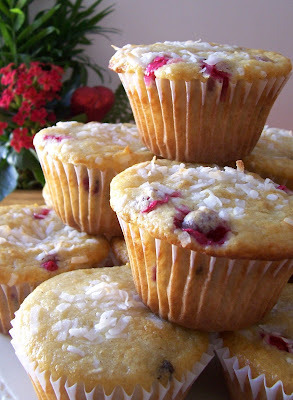 They're kid friendly and freezable like most muffins. If I wanted to freeze them I could bury them in the four feet of pristine white snow in my backyard but you can just put them in your freezer. 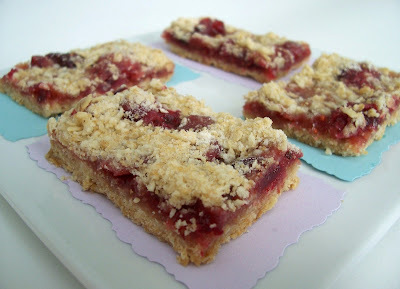 These Cranberry Pear Bars were not on the menu for today. I didn't have all the ingredients for what I originally intended to make so when I saw a frozen package of cranberries in the freezer, I decided to do something with them instead. I have posted quite a few recipes like this one where an oat base is topped with fruit and then sprinkled with reserved base mixture. This recipe is even easier because you can whizz everything up in a food processor or you can use a pastry blender. The cranberry filling is similar to making cranberry sauce except you don't let it get as thick or as sweet as the turkey topper. I suppose you could use regular cranberry sauce, the choice would be up to you. The overall bar is quite wholesome and healthy tasting. It is definitely not sugary sweet and the tartness of the cranberries shines through. I think some cinnamon in the oat base would be a great addition to make it more flavourful but on the whole, it is quite a nice bar. They slice very cleanly and can be frozen so you can enjoy them for much longer than you first anticipated.